You are currently browsing the The Pet Product Guru blog archives for the day Sunday, August 25th, 2013. The answer to this is a simple one. Unless your dog has skin problems or had a long roll in the mud, you really don’t have to bathe him at all. You may want to make him more pleasant to the smell, so in this case a few baths every now and then would be fine. Just like people, some dogs may smell worse than others. 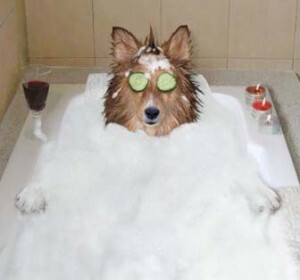 There are some dogs who never had a bath in their lives and yet don’t have any unpleasant odor. Then there are those dogs who do require a weekly bath so you don’t have to hold your nose every time he comes by you for some love and affection! As a general guideline, bathe your dog, once a month and use dog shampoo or human baby shampoo. If you want to bathe more him more frequently, use a soap free or moisturizing shampoo so his skin doesn’t get dried out. We are continually adding alternative songs to LINDBERGH RADIO’S music library. Check out our new sound and listen to five other great stations on THE EDGEWATER INTERNET RADIO NETWORK!